These houses are in a town known for its historic center. PROS The family room — with its exposed beams, skylight, hardwood floor, sliders to the deck, and myriad windows overlooking a brook and a big backyard with a pear tree — is the go-to spot in this raised ranch, built in 1953. The home needs cosmetic work but has a lot of potential. The exposed brick and pass-through in the kitchen and the fireplace and bay window in the living/dining area lend character. The partially finished basement adds 744 square feet of living space and holds a third bedroom with a separate entrance, full bath, laundry area, and a wood stove. 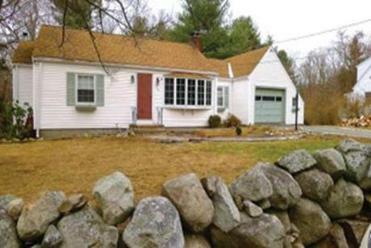 The septic system was replaced two years ago, and the roof and windows are fairly new. It’s a short hop to major highways. CONS The house fronts a busy street. PROS Nearly every room in this 2009 hip-roofed Colonial has a surprise element, from the pocket doors in the dining and family rooms to the French doors in the office and the tray ceiling in the master suite. Have breakfast on the deck overlooking the tree-buffered backyard with plenty of privacy, in the eat-in kitchen at the granite-topped peninsula or island, or at a table in the bump-out. Relax in the jetted tub in the master, where the bath is clad in marble and the suite offers double walk-in closets. Spend a rainy afternoon watching movies in the attic, which has been transformed into a media room; the equipment is negotiable. CONS Garage access is from the basement.